The Wiltron 3652 is a Type K Calibration Kit. 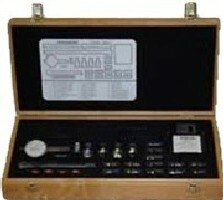 The 3652 contains all the precision components and tools required to calibrate for 12-term error corrected measurements of test devices with K connectors. Components are included for calibrating both male and female test ports. The 3652 kit supports calibration with broadband loads. Option 001 adds sliding loads.